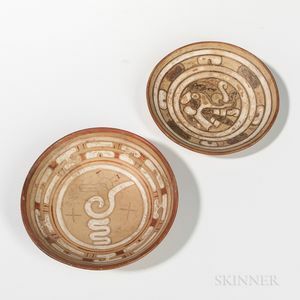 Two Isla de Sacrificios Bowls, Post Classic, 1200-1500 AD, including one of shallow form painted in brown and white with a snarling deity's head, with curling snout and projecting tongue, the other painted in white and orange with an animal perched on its coiled tail, dia. 7 1/2 and 7 1/8 in. Provenance: Private collection Long Island, New York; Sotheby's, New York, May 16, 1989, Lot 373.